﻿ Sheridan Beach Resort and Spa, Palawan | FROM $110 - SAVE ON AGODA! 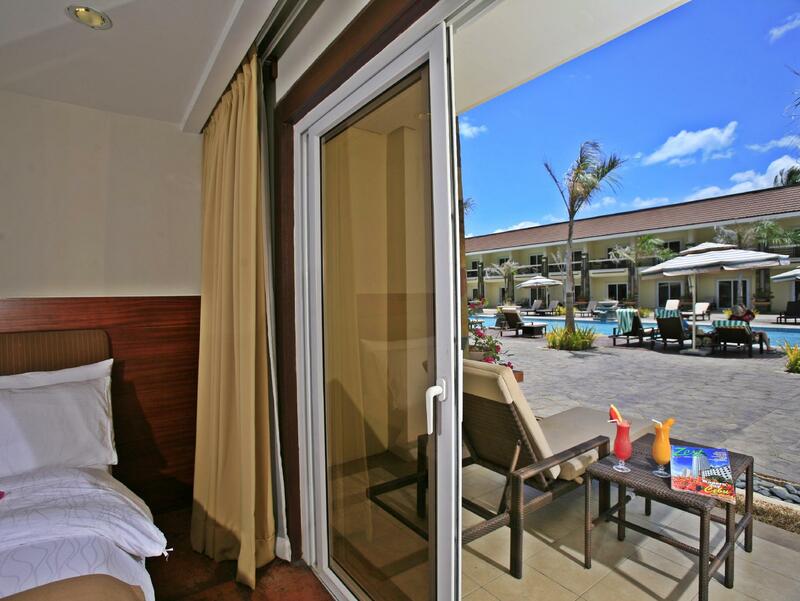 "The breakfast included was very good with different selectio..."
Have a question for Sheridan Beach Resort and Spa? "The location is ideal, as it is far away from the airport and allows you to unplug from the chaos of the city center." "Huge pool area Fantastic view"
"Good hotel near the beach." "Service was first class, buffet breakfast was always changin..."
- 12 years old and above is considered an adult. Applicable charges will apply. Roundtrip shuttle service will be charged at PHP1000 per person for all reservations starting Jan 1, 2013 onwards. Please note that the declaration of the Puerto Princesa Underground River as one of the Official NEW 7 WONDERS OF NATURE has resulted to the sharp increase in influx of visitors to the Park. To conserve it in its natural state, a carrying capacity of Nine Hundred (900) Visitors a day is currently in effect and a no permit, No entry policy is strictly enforced. Management highly advises that a Visitor Entry Permit (VEP) be secured 2 months before proceeding to the Park. The hotel sincerely regrets and apologizes for any inconvenience. The Sheridan Beach Resort provides great amenities for travelers who expect a safe, clean, reliable and friendly and proficient customer caring services. We really think that we could have stayed there for at least a week because the resort is so pristine and enchanting. The pool well maintained, huge and awesome. The restaurant is thoughtfully designed for buffet and events, and menu choices are plentiful. Swimming in front of the resort is so nice. The ocean view was spectacular - We had suite 226-227 and are so happy with the value for money - it is such a romantic and spacious unit with 2 huge terraces and a separate large living room with large flat screen tv. The location is a worthy 2 hour drive from the airport. We appreciate the drive through the Palawan jungles as there are very interesting roads that you pass along the way. When we return to the Sheridan Beach Resort it will be for a week. The people, landscape and culture of Palawan are unforgettable!! My partner and I really enjoyed our stay at the Sheridan overall. Positives: Amazing pool, large beds, friendly service, delicious cocktails (became hooked on the Banana Coladas), buffet dinners were great. After 6 hour bus ride from El Nido, my boyfriend realised he left his passport there. The reception at the Sheridan arranged the passport to get delivered to us from our other hotel in 1 day. Improvements: Restaurant was expensive. There are plenty of local restaurant to go to with delicious food around 180-300 pesos, instead of paying Australian prices for a meal. They used plastic straws. In El Nido & Coron we didn't come across a single plastic straw as all places used bamboo/paper straws. I would think that an expensive resort focusing on environmentally friendliness would limit their plastic use. Needs some maintenance. Eg, bathrooms could use bleaching, pools menus all rusty and needed updating. For $220 a night, we expected better. But we'd stay again for sure. Great location and beautiful resort. The beach was amazing. Stayed in Sabang suite which was a lovely room but was overpriced for what you get though. Pool was fun but what is with the sharp rocks on stair edges and pool bar seats and floor. Both my partner and I cut our legs and feet. The food was good but not great. We were a little disappointed with the breakfasts. Shower water would get warm but not hot. Small complaints on what was an overall enjoyable experience. I will recommend this resort however I just wish the cost was a little more in line with what you get. Tourist mecca for the river, this little beach town is relaxing. The hotel is very nice with a nice buffet breakfast. Fresh air, accommodating staff, clean rooms. Deluxe room is small but enough for three persons. 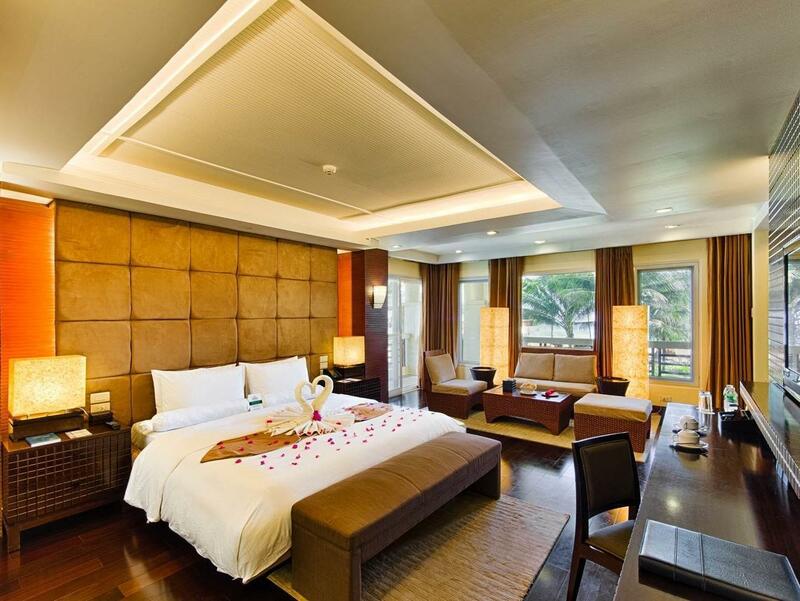 Luxury room has one matrimonial bed good for 2 persons. Since we are group of three we ask for another bed for free. Everything is perfect here. Away from busy streets and if you're someone who wants to have a quiet time this is for you! This was a gorgeous hotel, lovely pool, friendly staff, amazing pillows. Me and my friend stayed here for a few days to do the underground river tour and it was fab. Great location a few minutes either side, beachfront you can go to lots of places to eat and drink. on the right a place called Asiana, highly recommend their food. The Sheridan was a little bit of luxury on our travels and wish I could have stayed there longer. Fantastic location. The resort is well kept. Staff is friendly. Restaurant staffs are trying their best but most of the time they are overwhelmed with all the orders. Spa was really good and they are flexible with combination massages. The staff are amazing, very warm welcome and everyone there are very polite. The beach is beautiful, with very nice mountain views. Easy access to the underground cave. The food is very good with the nice view of the beach. Nice nightly entertainment. This was my family's first time to Palawan. With younger kids we did not feel ready for El Nido and adventuring. We chose the Sheridan Beach Resort and Spa because of location, reviews, and the options to be adventurous to a kids level. This resort did not disappoint. The breakfast included was very good with different selections every morning. At dinner you had options for al la carte or buffet. We did the buffet both nights and were happy. The night time entertainment was great with exceptional singers and fire dancers. The staff at the resort are great. Always ready to help and had a positive attitude. Only downside was the Wi-Fi but I'm on vacation so I didn't mind so much. If this is your first or 10th visit to Palawan this place is a good choice. The staff at Sheridan were absolutely beautiful - everyone was so polite. The rooms we booked were super clean. If you're booking here just be aware that the location is a bit isolated from everywhere else. perfect if you're after a holiday to just relax and not do much for a few days. It is super close to the underground river so it is a MUST do when you're there. Variety of food was a bit hard - you're pretty much stuck with the restaurant in the hotel or there are a few stores if you for a walk. Also if you're going to use the gym facilities - best not to (sorry!) - the equipment is super old and a lot of the machines were out of order. Other than that it was honestly such a nice place to stay for a couple of days and would definitely stay here again. Firstly the staff are really excellent. I am used to the natural friendliness of the filipino people as I have been working in Manila for almost 2 years. But in addition to that friendliness, you will the most attentive staff at the Sheridan. When you come here, you can truly relax, away from the normal commercialised tourist areas. The Hotel setting is great, the views of the mountains, the sea and even the swimming pools are awesome. The Subterranean River is a must and of course the reason we come here. I also recommend the Zipline and supporting the locals in their shops, restaurants and fresh fruit shake outlets. The food in the hotel is predominantly filipino, with some western choices. A great place for a 3 or 4 night maximum stay. Staff was amazing and upgraded us upon check-in. The property is the nicest in the area and sits on a little beach with a small village for souvenirs and massages on either side. I loved the fact that it is a quiet and secluded area. Not much to do but chill at the resort but that was fine with us. Close to the underground river for touring. Wonderful hotel, right on the beach. Great staff, very friendly and always saying hello. Bar and restaurant was good with nice food. Some local attractions were near by but for the main town of Puerto Princesa or the island hopping trips this hotel was very far away (2-6 hours travelling time). However, for a relaxed beach and swimming pool stay this was excellent and wished we had spent more time there. The Interent in room is very very bad . Very limited items in Breakfast , lunch and dinner . 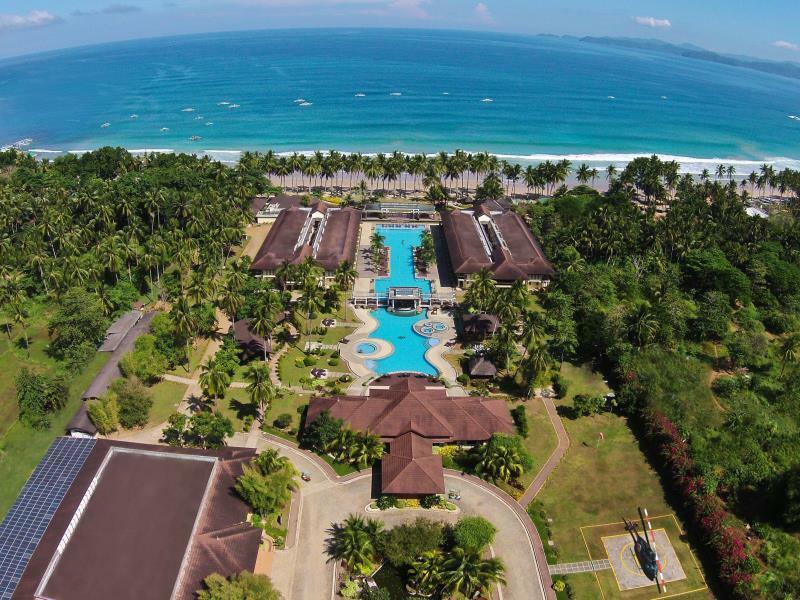 Sheridan Resort is located on the beautiful Sabang beach with rolling waves and close access to the underground river tour. While a little pricey for the Philippines it’s a good place to relax for a few days. There are very few close options for eating/drinking so 3 days was long enough for us before we got tired of the hotel amenities. The pool is great and staff are very friendly and accommodating. Horrifying scenes. As soon as you opened the door to the room a damp smell hits you in the face. Tried to change rooms, put us in a similar slightly ‘better’ room. Walking into the room, everything is mouldy, dated and disgusting. Stains on bed, towels floors, walls. Couldn’t put tooth brush on or around the sink as it had green and black goo surrounding it. And wearing slippers in shower was a must!! Couldn’t feel clean standing there. Restaurant and cleaning stuff were amazingly friendly but reception was the least welcoming of all(crack a smile once in a while)even smiling at them didn’t help, always cold and unreceptive response! And also very unhelpful. Tried to book PPUR, when we asked what time the ticket office opens were told at 6, woke up at 5.30 rush over, just to find out it opens at 8.30! We were put in a twin room and had to ask reception to put bed together 5 times, FIVE TIMES!!! After long flight and taxi ride, didn’t have the energy to move or fight, we just wanted to pass out. Finally did it on the second night! Stayed 2 nights as it was prepaid but couldn’t get out of there fast enough! Put a damp on our holiday, literal and figurative sense of the word. Shame it is one of two resorts in area, but honestly, seeing the huts of pack packers in the area was better, where the only complaint was ‘cold shower’ !!! Honestly for the price we paid, would have been less painful in a hut with clean bed and a cold shower!! Buttt... resort is ‘waw’ when you first arrive until you actually speak to the reception... but it’s in a great location! 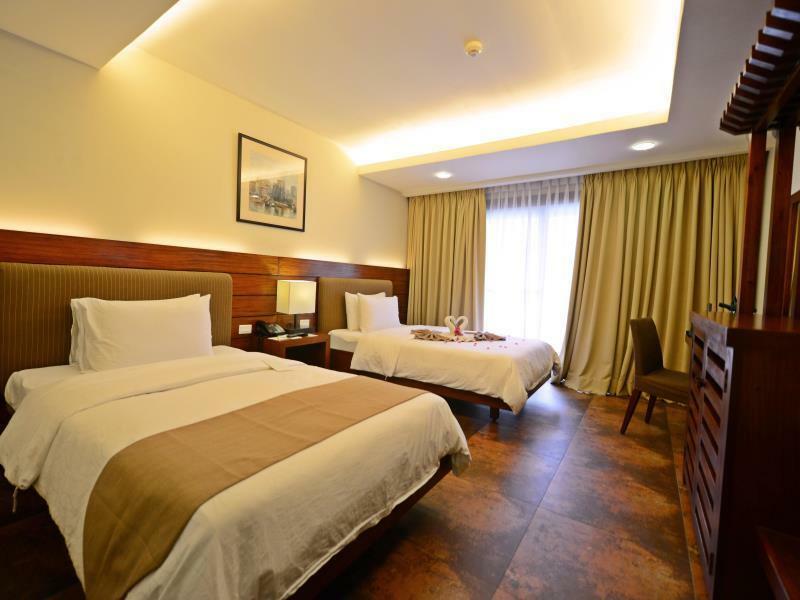 The room was spacious, air-conditioning quiet, house keeping cleaned the room well and the reception staff were pleasant. The water provided in the room as well as restaurant and gym tasted of chlorine or simply not nice. The breakfast was not tasty, not a high class buffet. The prices for tours, food in restaurant, bottled water and everything else overpriced at least 30% more than outside services. Restaurant staff were a bit annoying and pushy when trying to upsell for rice and salad after declining the offer twice. Overall, the beach was splendid, though the experience didn't live up to the expectation for such a price. We spent our 1st wedding anniversary at this resort, & we couldn't be more thankful. We were travelling with our parents too. My husband and I booked a suite room, while my parents booked a deluxe room. The personnel are very courteous, helpful, and thoughtful. We arrived at 10:30 AM, but since we booked 2 rooms, they allowed us to occupy one of the rooms, which was already available. After 30 minutes, the other room was also ready, so we were able to transfer. These are all without additional charges, even if official check-in time is at 2:00 PM. They were thoughtful enough to put flower petals on our bed. This resort has all the amenities that you need (swimming pool, sports area, gym, karaoke room). The only down side is that currently the jacuzzi is not working. We would have loved to enjoy it. The food is just okay. There are a lot of other resorts with better quality food and wider range of selection. But overall, our stay was still memorable and relaxing. Thank you Sheridan!